Link to the presentation video. From Monday to Friday from 9 a.m. to 2 p.m. And from 4 p.m. to 8 p.m.. It will be closed on weekends, holidays, holiday periods and during the month of August. Academic staff of the University of Alicante. Researchers (from outside the UA) with justified need of the collection in this researchers room. Postgraduate students (Master, Doctorate) of the University of Alicante. 1,416 copies of Spanish, English, French and Italian books of the 18th and 19th centuries. Critical studies and consulting works. Books in Latin, Portuguese and Catalan. 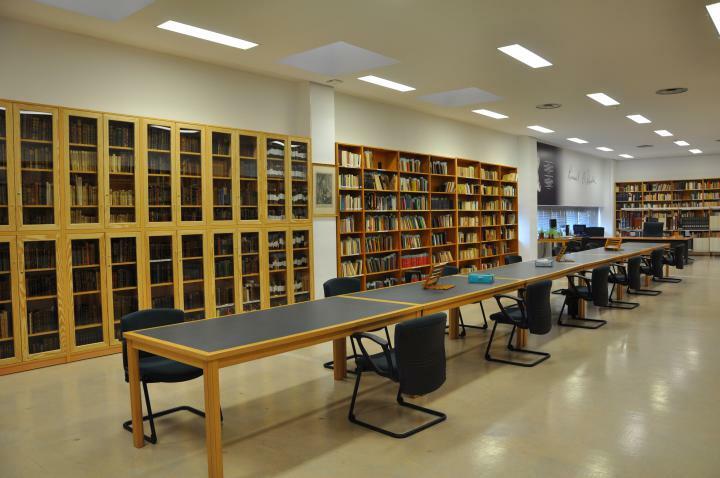 Collections of ancient Spanish, English and French books of the 18th and 19th centuries. Works of authors of the eighteenth century and the romantic era. Spanish-American literature and history of Spain and Latin America. Books by German authors translated into English. A small collection of horror works. Some titles of philosophy used in the studies developed by Sebold. 94 copies of small format. Some copies of the Hispanic review and Dieciocho. Publications prior to 1958 . Funds of unique character and historical value for the University of Alicante . Foreigners identification number (NIE) If you were a foreigner residing in Spain. Passport (for non-resident foreigners in Spain) or identity card (for EU citizens). Researchers, before starting their work, must fill in a form with, in addition to your personal data, the object and the subject of the research. Jackets, bags neither wallets are not permited. These elements will have to be deposited in the lockers enabled at the entrance of the room of researchers. Will be able to access with pencil, paper sheets, fascicles, books and portable computer without its case. To statistical effects, we will register the books that are being consulted by the researcher. Therefore, please do not returns the consulted books onto the shelves. Leave them on the tables for this end. The researchers room funds are excluded from loan and the inquiry must be done in the room. Write, underline or make any sign or mark on the pages of the books is prohibited. The sheets of the books must be passed with clean, dry hands, and for antique books the use of gloves is obligatory. In any case the tips of your fingers must be moistened for this operation, nor will rest on writing, engravings, or illuminations. The library should provide the user with the instruments suitable for the consultation of each material: magnifiers, lecterns, gloves, etc. A direct copy of manuscripts and printed editions of the 16th, 17th and 18th century is strictly prohibited. For the rest of the collection, with research purpose only, a photocopy of parts (covers, preliminaries, table of contents, etc.) may be made. The use of certain funds may be restricted for reasons of conservation, being replaced where appropriate by a digital reproduction. The computer of the Room will be only enabled for the query of the catalogue or the databases.The room has of scanner of documents. Drinking or eating in the room, or any other behavior that alter the study environment is not allowed. The mobile phone must be silenced. Failure to meet these standards may lead to the loss of the right to use the room. The Russell P. Sebold researchers room can also be used as a seminar so professors can show students the documentation present in the room to teach theoretical-practical sessions in which it is necessary the use of bibliographic materials from the library of Arts and/or the researchers room. All this without prejudice to the researchers who may be using the room at that moment.